The Hebrew Scriptures open up with the account of divine creation. The book of the true faith in the earth begins by establishing the reality of the Most High as the One responsible for the existence of the universe. His omniscient imagination worked a sweeping grandeur into energy and matter. Worlds, stars, and wonders without number fill all of creation. The fabric of space and time is imprinted with the fingerprints of the Holy One. His masterpiece holds watermarks of His truths in ways mankind is only yet beginning to understand and appreciate. It is His world, and we are blessed to be in awe at what He has done. The scientific endeavors of men both secular and of true faith have yielded results that serve to give us insight and knowledge of the barest minimum of what astonishing genius of a work He has accomplished in the manufacture of the universe. Time after time, the results of serious and good science have confirmed what our faith has postulated for centuries: He has ordered creation to function as a clockwork design, so that men can see in the world a divine wisdom permeating the natural processes we encounter. The framework of reality, of the world in which we live in from birth to death, is one built upon the elements of creation. All matter is constructed of building blocks that have been studied for millennia, and continue to yield new and amazing details of how our universe functions. Those elements are laid forth and grouped for the ease of research and discussion in the chart known academically as the periodic table. Over one-hundred elements have been identified to date, and their nuances and interactions have been and continue to be studied, so that man can benefit from the world around him to the fullest. ​There is one detail concerning the periodic table that is not widely known, however, and bears upon the overlap of faith and scientific study in a beautiful manner. Of the over one-hundred elements known to mankind, it is generally accepted that ninety-two of those elements are encountered naturally on the planet earth. The other remaining elements are not found to exist by themselves under natural conditions on this earth, but can be synthesized in controlled laboratory conditions. For the normal person, however, ninety-two elements are the commonly-encountered building blocks of the universe on this earth. The overlap of faith into this scientifically-observed reality is perceived when one begins to look at the Torah’s first book of Genesis. While there are thousands of words in the Hebrew text of Scripture, those very words are formed from a much smaller group of root words. When it comes to the creation account of Genesis 1:1 – 2:3, the Hebrew text contains a scant four-hundred sixty-nine words. Those words are actually made up of a smaller number of root words. The amount of root words used in the creation account is actually ninety-two root words! Rabbi Zalman Pinchas Horowitz (1731 – 1805), is the first person to have recorded counting the actual root words contained in the Hebrew text of the creation week account, a detail preserved in the posthumous collection of his writings called Ahavat Torah. This fact of ninety-two root words making up the framework of the creation account of Scripture displays the overlap between faith and science in the periodic table’s ninety-two naturally-occurring elements on earth! The insightful realization of this link came to the attention of Rabbi Yitzhak Ginsburgh, and can be found in his online paper Periodicity in the Periodic Table of Elements. The reader is encouraged to peruse that link to the paper to appreciate further the spiritual value it brings to the topic. While Rabbi Ginsburgh’s paper is important in establishing the basis for the link between elements and the creation of the universe, he relies heavily on the Jewish numerological method of gematria to elicit certain connections between aspects of faith and the elements of the periodic table. This particular study is much different in that it is aimed at taking a closer look at the actual real-world affinity between the ninety-two naturally-occurring elements on the periodic table and the ninety-two root words that comprise the creation account in the Hebrew text of Scripture. 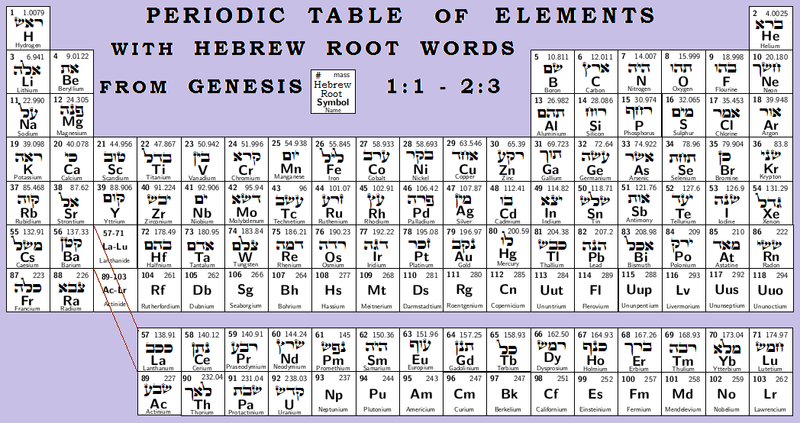 Such an endeavor is accomplished by first overlaying the periodic table of elements with the ninety-two Hebrew root words used to make up the creation text, aligning them exactly with the elements as they appear consecutively in the flow of Scripture. It is a straightforward method with no alteration, simply letting the root words fall seamlessly into the respective elements of the periodic table. Using this alignment of Hebrew root word with corresponding element, we can then begin to look at the aspects of the element as well as the meaning of the root word, and find in this appreciable parallel that display the consonance of the Word of the Most High with the world He has made. ​This alignment serves us to be a springboard for further in-depth study of how the Word and the world are intricately and intimately connected; how spirit and science are interwoven and cannot rightly be separated from one another. The result shall be seen that they are in complete harmony! For the purposes of this study, only a small handful of words and elements have been chosen to inspect and see the beauty of the alignment of verse and universe! …and they saw Yeshua while He was walking upon the sea! And when He drew close unto their ship, they feared. …and the Spirit of Elohim was moving upon the face of the waters. This factor links us to the number of protons in the nucleus of lithium and the ability it possesses of floating on water. The location of ELAH as falling into lithium’s placement on the periodic table shows a simple initial example of the types of alignment and parallel that can be found all over the periodic table’s ninety-two naturally-occurring elements and the respective Hebrew root terms of the creation account. The element of carbon contains some interesting details worthy of noting here. Not only is carbon the fourth most prolific element in the known universe by mass, it is also necessary for all known forms of life, and especially so in the human body, as it makes up the second most abundant element in our systems, with oxygen being first. The corresponding Hebrew word occupying its space on the periodic table is ERETZ, meaning “earth / land.” Man, for whom carbon is essential for life, was made from the earth, an event that the creation account details as occurring on the sixth day, which is of curiosity because the atomic number of carbon happens to be 6 – there are six protons in the nucleus of carbon. Carbon is found in graphite, one of the softest materials used by man, and is also the element of the strongest material ever tested by man, for under the right conditions, when graphene, which is a single layer of carbon atoms densely packed into a ring structure, is extracted from graphite, it has a breaking strength 200 times greater than steel. These facts signify that we who are made from the “earth,” that is, as carbon-based life forms, have the potential to be soft-hearted or harder than steel in respect to our position before the convicting power of the Holy One. Carbon shows us that both potential realities exist within ourselves, and the circumstances of life might factor in on such outcomes, but in the end, we can look to the Holy One who gives us a new nature that is formable in His hands to do His will. ​While on the topic of man, an element that merits mentioning here is tantalum. Tantalum has as its corresponding Hebrew root word the term ADAM, which means “earth / man.” Tantalum has the detail of being a ​highly biocompatible metal, meaning that it can be used in a biological system without fear of toxic reactions. For this reason, it is used specifically and to great effect in the medical industry for many implants and bone alloys for humans. ​The element silicon also contains unique aspects that speaks of the wisdom of the Creator. It is the second most profuse element in the earth’s crust, making up 28% of the crustal mass, with about 90% of the crustal mass actually being made up of silicate minerals, making is incredibly important to life on this planet. The Hebrew word found in silicon’s placement is the word RUAKH, meaning “Spirit / Wind.” We read in Genesis chapter 1 that the Spirit of the Creator spoke to the waters of creation and formed the earth out of those waters, and the second most prolific element on the earth is silicon. And I shall give to them one heart, and a new Spirit I shall place in your innermost, and I shall remove the stone heart from their flesh, and give them a heart of flesh, so that in My statutes they shall walk, and My right-rulings they shall guard, and perform them, and they shall be for Me a people, and I shall be for them Elohim. ​The element phosphorus is absolutely essential for all known forms of life, as it forms part of the structural framework of DNA and RNA. The very building blocks of life itself depend upon the presence of phosphorus. Living cells utilize phosphorus in the transportation of cellular energy in the form of ATP – adenosine triphosphate. In fact, nearly every single cellular process using energy acquires it in the form of phosphorus-driven ATP. Without ATP occurring through the presence of phosphorus in a body, there is no life taking place. These factors are important to note because the Hebrew term connected to phosphorus is RAKHAF, which means “movement.” It was the Spirit that MERKHEFET (moved) upon the face of the waters that kick-started the process of creation to make life possible. Thus, the necessary presence of phosphorus and the resulting transfer of ATP between cells aligns perfectly with the parallel of the Hebrew word RAKHAF (movement). ​The element neon is found in abundance throughout the universe, but it is very, very rare on the earth, for it forms no compounds to affix it to solids, and thus be easily trapped. Rather, it is found most readily in the air itself, through a process known as fractional distillation. When the element is acquired, it has its most common use in incandescent lighting with its recognizable reddish-orange glow. The Hebrew term found in this element’s space happens to be that of KHOSHEK, which means “darkness,” and is derived from the concept of “restraint,” in that darkness is the “holding back” of light. Thus, out of the darkness comes a brilliant light in neon. It was the Most High who made light to shine out of darkness, and this alignment with neon so beautifully speaks to that. Additionally, the word neon is itself derived from the Greek NEOS, meaning “new.” What was the first new thing that Scripture speaks of the Most High creating in the creation account? Out of the darkness came forth light – just as neon, a brilliant light, can be harvested out of the air itself. ​The element of tungsten, when in pure form, has the highest melting point of all elements wherein it retains its solid form. It keeps its shape when heat is applied longer than any other element. The Hebrew term found in its place is the word TZELEM, which means “image / shape / shadow.” The link makes perfect sense, doesn’t it? Additionally, science has found that tungsten has a use primarily as an integral part in x-ray tubes, as the filament and the target. The result of an x-ray produces an “image” or a “shadow” of the object targeted, just as the Hebrew word TZELEM has the concept of an image or a shadow. ​The element argon is used heavily in incandescent and fluorescent lighting, producing a striking blue-green light. It is also used as the target in neutrino experiments and in experiments searching for dark matter, as it creates a scintillation light that can be detected when a hypothetical WIMP (weakly interacting massive particle) of dark matter collides with the nucleus of argon. In the placement of argon we find the Hebrew root term OR, meaning “light.” This Hebrew term fits well the use of the element by man. ​Nitrogen is an element that occurs in all known living organisms and plays a truly vital role therein. It is a constituent element of DNA and RNA, which are responsible for carrying genetic information - that is, what makes you, you! Nitrogen is also found in the chemical structure of almost all neurotransmitters. Neurotransmitters are chemicals which relay, amplify, and modulate signals between a neuron and another cell, which are thus responsible for such nuances as wakefulness or arousal, voluntary movement and motivation, as well as wanting, or pleasure, to memory, emotions, sleep and temperature regulation, and even motor behavior. 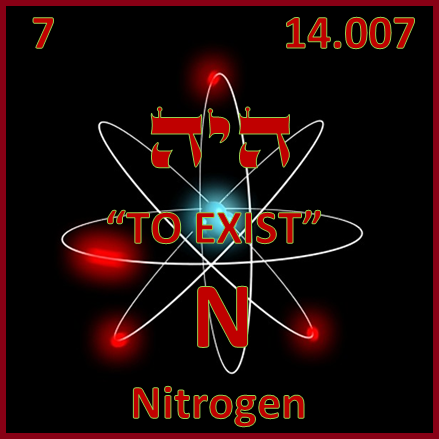 The corresponding Hebrew root word for the element of nitrogen is, perhaps not surprisingly, HAYAH, which is defined as “to exist.” The role nitrogen plays in the human body is of such a nature that humanity can experience “being” in multiple facets! ​One final element will be addressed in this study, as a further proof of the intimate involvement of the Most High with the creation. There is a word used in the very first verse of Scripture pointing to the Messiah Yeshua in an amazing way. It is the Hebrew term ET, and is not typically translatable into the English language when it appears in the flow of text. It works more as a grammatical function than a translatable term, and while it is most certainly a feature of the language, it appears to be able to take on at times a pointed referral to the Redeemer. It is made up of the first and last letters of the Hebrew alphabet, and has for millennia been viewed by those in Judaism as a divine mark in the text of Scripture. Since Messiah speaks of Himself as the first and the last as recorded by John in the book of Revelation, and the word ET is made up of the first and the last, it should not be ignored. Additionally, since the book of John 1:1 speaks of Messiah being the Word that was in the beginning and “with” the Most High, and this word appears in Genesis 1:1, right after the word ELOHIM, one can rightly assume that the symbolic nature of the term as referring to Messiah there is plausible and likely, due to the more spiritual approach of John in the writing of His Gospel. Returning to the modified periodic table with the Hebrew root words inserted alongside the respective elements, this very word of ET is found to be in the place of the fourth element, that of beryllium, with an atomic number of 4. Knowing that the Hebrew word in this box speaks so brilliantly concerning the identity of the Messiah, it should be expected to find that this particular element has characteristics which affirm great truths about the Messiah. As we begin to look into the element of beryllium, we find many special characteristics which point straight to the Redeemer of man. One of the first aspects of this element is the unmatched speed at which sound passes through it at room temperature. Of all the elements on the periodic table, sound passes through beryllium the fastest. To some this may not be of any worthwhile measure, but when taking into account that the speed of sound in other elements is far slower, as we see in mercury, which is 1,451 meters per second, or lead, which is 1,960 meters per second, to even aluminum, which clocks in at an impressive 5,000 meters per second, it becomes quite evident that there is something very exceptional about beryllium, which leaves them all in the dust with a speed of sound coming in at an almost unbelievable 12,870 meters per second! The speed of sound through beryllium is over twice as fast as in all the other elements! This shows rather blatantly that it stands head and shoulders above the others in a very intriguing manner. So what relevance does this detail hold to beryllium’s relation to the Messiah? The uniqueness of this fact finds its significance in that the Messiah is the “Word” that was utilized by the Creator Himself through which all would be manifested. The Holy One used the nature of the Son to translate His creative will, in essence. In multiple passages through Scripture, it is declared that the Most High is the Creator of the world, and yet Scripture also declares that the Son was integral in the creation act. Both Father and Son were involved in the process of making the worlds. Looking at the properties of beryllium in light of the word ET shows this precise connection. Messiah was the most excellent means by which the creative desires of the Holy One would become a reality, and He chose the element of beryllium to convey that particular divine truth, since sound passes the quickest through that element. All was by the hand of Him, and apart from this not even one thing could be something that could be. It was through the Messiah that the Almighty’s desire to create heaven and earth was made a reality. He spoke His divine command, and the Messiah was the perfect “element” through which that sublime sound traveled, being the vehicle that carried the decree and brought forth the fruit of the Spirit’s will: the universe and all that is in it! Thus, the relation to beryllium’s special nature concerning the speed of sound is seen in that beryllium has the ability to relay sound-waves from one location to another faster than any other element. If one had to choose any element to use as a medium through which acoustic information could be sent, then beryllium would be the element of choice, as it would deliver the information quicker than anything else. So it was that in the creation of the universe, the Father spoke His authoritative command, and the Son’s Presence distributed the sum of that creative command into its individual aspects, and all the details of matter and energy would have begun to take on their respective natures and states. In studying the atomic nature of beryllium, it is discovered that it contains only one stable isotope. What is an isotope, you may be wondering? Isotopes are atoms of the same element that have the same atomic number but different masses due to a different number of neutrons. In other words, isotopes of an element have a nuclei with the same number of protons (i.e., the same atomic number), but different numbers of neutrons. Now, an atom is made up of protons and neutrons, which comprise the nucleus, or “core,” along with electrons orbiting the nucleus. So an isotope is basically a specific state of a certain atom. Elements can come in many different isotopes, and yet beryllium is stable with just one isotope. For an element to be stable means that it is not in a state of atomic decay. In other words, it is not radioactive. Beryllium, with the atomic number of 4 (having four protons), is stable with 5 neutrons in its nucleus, and contains 4 electrons orbiting it. Beryllium’s 4 protons are a hint to the four Gospel accounts of the Messiah. If this atom has less or more protons, then it becomes a different element altogether. Therefore, the 4 protons define the precise nature of the element. So too, do the four Gospel accounts show us the precise nature of the Messiah. Each account is useful and entirely needed, for each contains historical information and spiritual worth that the others do not provide. Each account is necessary for His followers to grasp just Who He is and what awesome things He did for us in His ministry here on earth. Beryllium just happens to contain the exact amount of protons in its nucleus, its core, that serve to uphold in a powerful way its link to the Messiah. At this point it would be wise to recall that, of the authors of the New Testament, aside from the already incorporated Luke and John who appear in relation to the four Gospels/Protons, there are four additional men who are responsible for the rest of the writings: Paul, James, Simon Peter, and Jude. The entire New Testament, then, was written by a total of eight men. These four additional writers serve to parallel the 4 electrons that orbit the nucleus of the beryllium atom. Thus the makeup of the beryllium atom itself is repeatedly speaking of the entire testimony of the Messiah. As touched upon previously, the stable isotope of beryllium also contains 5 neutrons. Without those 5 neutrons, beryllium is subject to decay, and is thus radioactive. Looking at the 5 neutrons present in the stable isotope beryllium, we are able to see the integral role that the five books of the Torah (Law) play in the life of the Messiah. If one attempts to remove the 5 neutrons (the Torah) from the 4 protons (the Gospels), then the natural order of things necessitates decay, since the core is then unstable. However, if one keeps Messiah’s message within the boundary of His Father’s instructions to man, then all is stable. Sadly, the faith of many sincerely-religious individuals has suffered because of the misplaced teachings of those who strive to divorce the Messiah from that which is a core part of who He is and for that which He stands. Together, the protons and neutrons of the beryllium atom are harmonious, existing as one unit, the basis or foundation being the 4 protons, which is symbolic of the four accounts of our Messiah’s life. This is important for us to understand because the Messiah is always the foundation. If we should remove the neutrons, however, it is then that trouble starts. As was previously made clear, beryllium is stable with 5 neutrons; nothing else will stabilize this element. If you remove the neutrons from the nucleus – even one, it becomes radioactive. 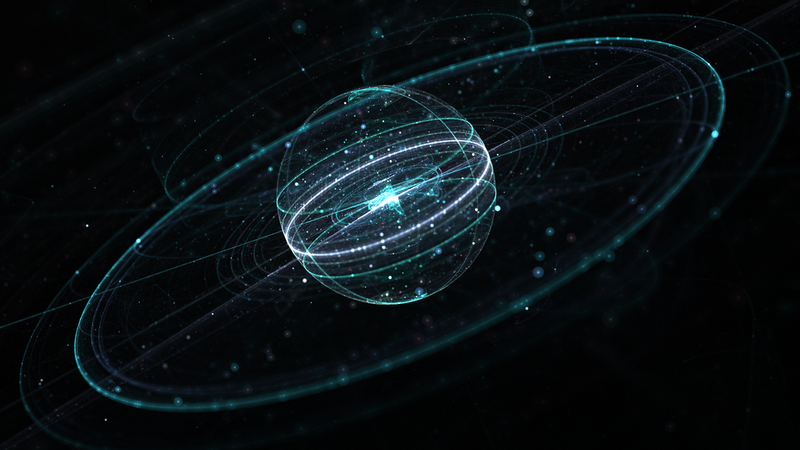 The proton must have at least one neutron to function as a stable nucleus, and this is true for every element in existence, except for hydrogen, the first of all elements, which contains no neutrons. But when it comes to beryllium, it has to have 5 neutrons to be stable. Now, neutrons and protons are the constituents of atomic nuclei. That is to say that they make up the nucleus of the atom. The number of protons in the nucleus determines the chemical nature of an atom, but without neutrons it would be impossible for two or more protons to exist stably together within nuclear dimensions. The protons, being positively charged, repel one another by virtue of their electrostatic interactions. This basically means that they would not normally bind together, but due to their very natures, would push themselves away from each other. The presence of neutrons weakens this electrostatic repulsion, this protonic repelling, without weakening the nuclear forces of cohesion, thus making neutrons absolutely essential for the formation of every single element other than hydrogen. If neutrons did not weaken the electrostatic charge of the protons, then no element heavier than hydrogen would be able to ever form because the protons needed to form the other elements could never come together. This truth speaks to the very special nature of the Torah in regards to the victory the Messiah acquired for His Father’s people. His obedience to the binding, unifying power of the Torah brought a redemption that otherwise would never have been experienced by mankind. Furthermore, neutrons themselves are stable only in their relation to protons. If you remove a neutron from the proton, then the neutron itself inevitably decays. 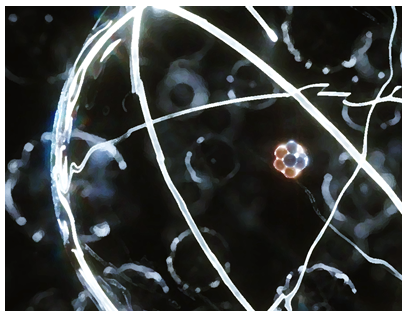 The half-life of a free neutron is 613 seconds, give or take .6 seconds. There is no coincidence that the Torah, the instructions of the Father, has traditionally been counted in Judaism to contain 613 commandments. With the neutron being symbolically related to the Torah, this particular detail is even more astonishing. If one attempts to remove the commands of the Torah from the context of the Messiah, then destructive things will inevitably occur, just as free neutrons incite neutron radiation, the inducing of radioactivity in whatever substance the free neutron encounters. This sort of atomic decay accounts for the majority of radioactive material that is released during the detonation of a nuclear weapon. So it is that one can clearly perceive through the natural composition of things how important it is to keep the Messiah in the context of His Father’s Word. These examples serve to display the varying levels of connection between science and faith, and how even the creation account of Scripture can be linked to the discoveries of modern science, and shown to be relevant in ways never imagined. 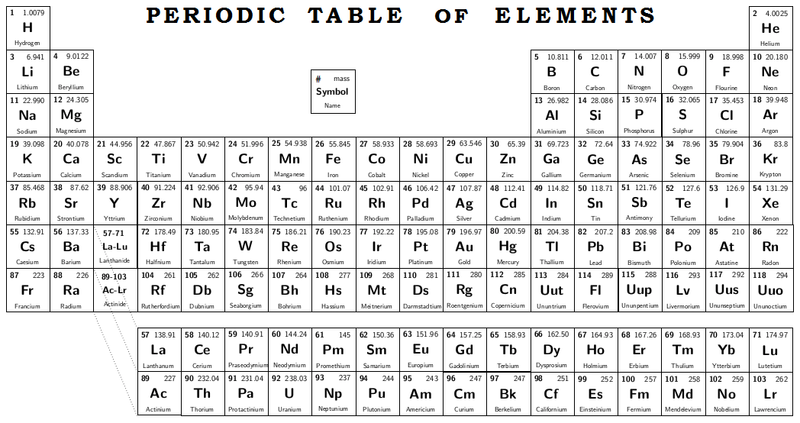 The periodic table is a great witness to the power and creative wisdom of the Almighty. Who would have ever thought that such amazing connections could be established between the table and divine certainties declared in Scripture? ​The surface has only been scratched thus far in what has been presented pertaining to the links that exist. It would be remiss to leave this topic thinking it is only coincidence. What has been exposed is powerful evidence demanding a serious analysis; one that calls for an unbiased investigation of the accounts presented in Scripture as to their scientific viability. What has been shown thus far is the springboard from which additional links shall be able to be established. 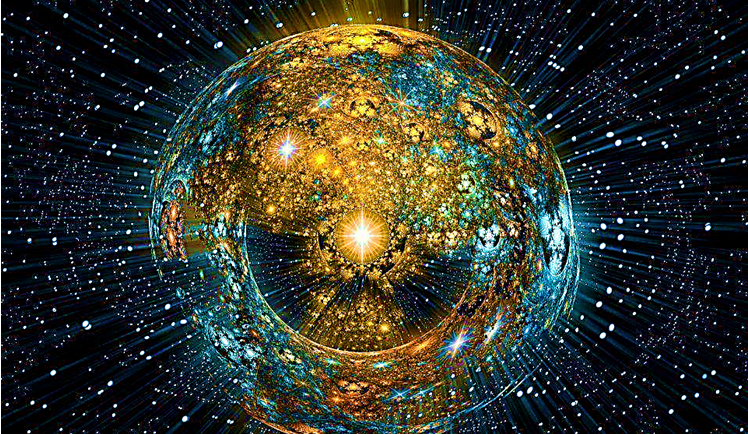 There are surely even more intricate and in-depth nuances to be uncovered as further aspects of the periodic table’s association to spiritual truths are studied out. The means for the unveiling of further worth are at our fingertips, and the well is not exhausted, but rather, overflows.